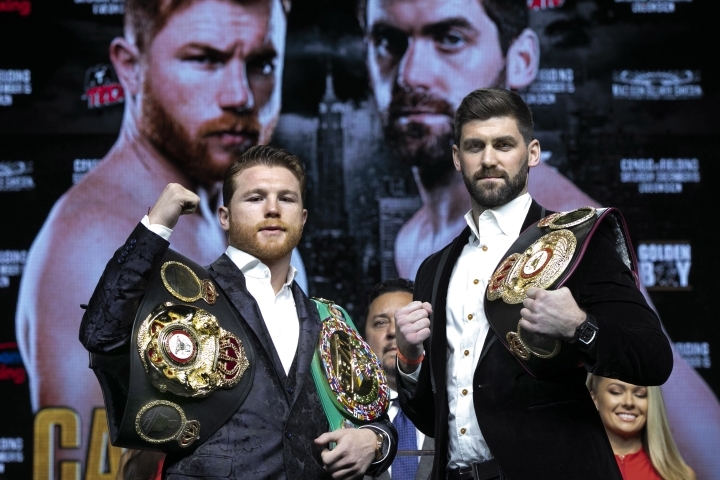 NEW YORK — In an odd way, there is more pressure on Canelo Alvarez when he fights Saturday night against unheralded Rocky Fielding than there was in his two matchups with Gennady Golovkin. A loss to the WBA super middleweight champion not only could taint his decision over Golovkin this year, it could significantly muddle the future for the Mexican star. Alvarez moves up from 160 pounds to 168 in search of a third division title, which would place him in special company among his countrymen — only eight others have held three division crowns. That's the quest at Madison Square Garden against Fielding, a heavy underdog despite owning the belt. "For me it is very big to enter that select group of Mexicans who have become three-division world champions," Alvarez said. "It is what is motivating me. It is very important to enter into that list of very big fighters from Mexico ... to enter history, that is what I want, to make history. Making history, the door is almost open. So I am very motivated to win this fight." As for moving up in weight but down in class — no one is comparing England's Fielding (27-1, 15 knockouts) to Golovkin — Alvarez insists there are no worries. He's not going to be looking ahead to his 2019 schedule just yet. "I never like to get overconfident, whether I am the favorite or not," said Alvarez, who is 50-1-2, the only defeat to Floyd Mayweather five years ago, when Alvarez wasn't quite ready for such a master boxer. "To me it is not important who is favored. For boxing, one punch can change everything; anything can happen in the ring. I get my confidence in training for what I can do in the ring." What he can do in the ring is punch with power, defend with elan, attack quickly or stealthily. It's not likely that Fielding, making his first title defense, has seen anything like Canelo in the ring. Fielding upset Tyron Zeuge in Germany on July 14 with a fifth-round knockout. This is his shot at the big time at age 31 — sure sounds like a Rocky story. So while the only time he's seen a sports event at the Garden was a Knicks game three years ago — Alvarez also is making his MSG debut — Fielding isn't letting on if he has any stage fright. "You know, I went to Germany and no one gave me a chance there," he said with a smile. "It's the same here. No one gives me a chance here, but I've prepared well, I believe in myself. I've come here as a champion." Alvarez, 28, comes in as a much more heralded champion. Some consider him the best in the business these days, and he's got some impressive victories on his resume. In addition to a win and draw over Golovkin, Alvarez has beaten Miguel Cotto, Amir Khan, Erislandy Lara, Shane Mosley and Austin Trout. More than a few observers question whether Fielding could handle any of them, let alone Canelo. But Alvarez is going from middleweight to super middleweight, which can be dicey. "That's the risk, to be moving up in weight, to fight somebody who is used to fighting stronger fighters, who is used to taking stronger punches," Alvarez said. "I know the challenge, but I like the challenge, and I am happy for it." Inevitably, Alvarez gets asked about a third bout with Golovkin, considering how close their previous two fights were, and the money and attention that would be there. He doesn't exactly shrug when questioned about it, but it's clear Triple G is not foremost on his mind. "It is no secret we want to win this fight and then come back to our division, 160 pounds," he said. "But we can make combinations between 160 and 168. We will see what the future has ... but I can guarantee we will go back to 160 pounds. "We had two good fights ... maybe in 2019 we can have a third fight. We'll see. Right now, I am 100 percent focused on Saturday. What I do know is I will fight in May and September next year. What I will do is give great fights to the public." NOTES: The main undercard fight of Canada's David Lemieux against Tureano Johnson has been canceled after Lemieux was hospitalized with dehydration issues while trying to make weight. A former middleweight champion, Lemieux always has struggled to make the 160-pound limit. But he was in line for a possible fight with Alvarez if he fought impressively on Saturday. In his last fight, he knocked out Gary O'Sullivan in the first round on the Alvarez-Golovkin card in September.